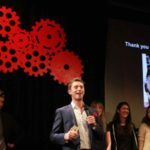 How Do I Get On A TEDx Stage? I hear it on a weekly basis, the question: ‘How do I get on a TEDx stage?’ Well, SPEAKER Express member Lizzy has done it (and some other members too BUT Lizzy is the only one who wrote about her experience). Pay close attention to the ‘clucking like a chicken’ bit :-). ‘Somewhere in the middle of October 2014 – I forget which day because they all merge into one – I was standing at the front of about 12 other trainee yoga teachers, cueing them into godknowswhatasana. Forrest Yoga guardian teacher Cat Allen was sitting at the back of the class, watching me. At some point, she stood up and whispered in my ear, ‘Do it like a sergeant major. Yell the instructions like they’re in the army.’ I was used to these challenges by now, having already taught poses clucking like a chicken and gyrating like Mick Jagger. This one, however, was different. I couldn’t do it. I tried to shout and stomp. Then I burst into tears. I remember very clearly being told that I was bossy as a child. I don’t remember who said it, but it was in the playground and I was very young – perhaps six or seven. And in the moment it was said, I knew it was true. I was bossy. I marched a gang of girls around. I thought everyone else was slow and stupid – including my teachers. I talked loudly and always wanted to be the centre of attention. I didn’t notice that others weren’t like this, until the bossy comment. At which horrifying point I decided to never be bossy again. And I wasn’t. And I didn’t realise the effect of that decision until I was asked by Cat to channel the exact qualities I’d worked hard for 25 years to pretend I didn’t have. As the training rolled on, I hit the same wall again and again. Forrest Yoga is the only practice I know of in which trainees must teach members of the public – twice. My defining memory of cueing 30 ‘real’ students is Cat jumping up and down at the back of class mouthing, ‘Be louder!’ At some point I had a tearful conversation with my very wise best friend – a singer. ‘Honey,’ she told me, ‘They don’t want your voice to be loud, they want it to be strong.’ Ah, revelation. Yet how could I resonate my voice through a cavernous studio when I’d diligently trained myself into quietness? Would I ever be able to even teach yoga? Teach anything? I returned to the UK with these questions in my suitcase, knowing that some answers would present themselves. I didn’t have to wait long. 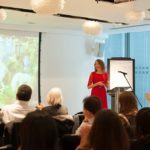 In January 2015 my friend and fellow health coach, Harriet, took me to London’s Speaker Express’ Club [now SPEAKER Express]. She’d been a member for a few months and was flourishing. I could see why. The energy in the room was infectious. As with every club night, there was a theme presentation followed by shorter talks by the club members, and then 60-second audience stage time slots. Harriet elbowed me in the ribs: ‘Go do it!’ And I just… did. I stood in front of an audience of about 50, one leg trembling as always, and promoted my health coaching programme. When I returned to my seat, I felt euphoric. Light headed and weak kneed, yes. But definitely euphoric. A couple of months later I joined. Speaker Express’ training – once a month – booted me out of my comfort zone again and again. And again. I was filmed speaking. Yuck. I crawled around board rooms making animal noises. Hilarious. I breathed deeply as I was given feedback by peers and professional speakers. Ouch. I told stories about myself, about my family, about what I’d learned. And I found that once I let go, got grounded, connected to my message, and mustered courage enough to be myself (always the greatest challenge, don’t you find? ), speaking in front of others was fun, actually. The shaky leg left me; the euphoria never did. As I found my voice and settled into my style, I started doing what Steve Jobs termed, joining the dots up backwards. I remembered narrating plays at infant school. Playing Cilla in a junior school send up of Blind Date. Reading a poem to hundreds at my great grandpa’s funeral, aged 13. I realised I didn’t need to be taught to speak; I only needed to remember. 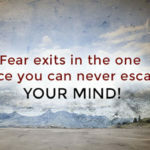 To burrow through layers of anxiety and self-imposed limitations and discover what had been there all the time: a natural love of – and knack for – communicating. Chakra expert Anodea Judith describes communication as, ‘The means by which consciousness extends itself from one place to another.’ Quite simply, we speak so important information can get from our experience to someone else’s. Information that may help them, inspire them, motivate them, uplift them, change their minds. Disseminating information is how s**t gets done, how stuff gets made, how evolution happens, how problems get solved, how we all move FORWARD. That’s why I believe you have a duty to share what you know. Withholding doesn’t help anyone. And it doesn’t matter what form your communication takes. I share what I know wearing stretchy pants in my yoga classes, wearing un-sensible heels on stage, and in blog posts like this one you’re reading right now. Those are my forums; yours might be different. You can share what you know on Twitter, over cups of tea, in letters or emails or texts. You can share to friends, family, colleagues, clients. How you share and what you share is almost irrelevant; it’s the act of doing it that matters – the decision to take a deep breath and say what you have to say. And it can be scary, but the knack for, what we term in Forrest Yoga, ‘Truth speaking’, builds like a muscle. The more you do it, the more you find you can do it. And as you observe how it changes you and the people around you, you may even find you like doing it. That’s how that first shaky quaky minute on the Speaker Express stage grew into a TEDx talk, and rapidly, too. 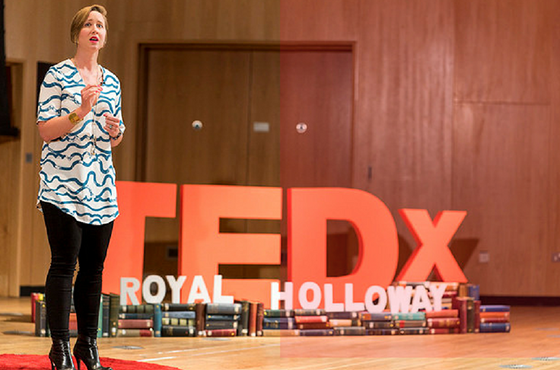 Only a few weeks went by between my mentor, Elliot, suggesting I apply for a TEDx, my friend Anna recommending me to the team at Royal Holloway, being invited to propose my ‘Idea worth spreading’, being accepted and then walking onto that red circle. But then again, those 13 minutes were also 25 years in the making, like a tree planted way back when suddenly coming into bloom. I think what holds many of us back from speaking up is a very natural and understandable fear of judgement. Keeping schtum is easier for sure, but in my experience it makes for a small life. When I tell people I used to spend my working days in a corner with my headphones on, barely saying a word, they can’t believe it. Neither can I, honestly. Since coming out of that corner my world has expanded exponentially and changed beyond belief. Everything, from the work I do to the people I spend my time with, to the ways I contribute, has shifted. The fear of hostility, of being told my words are wrong, worthless, ill-informed or irrelevant is always there (spoiler: it never leaves). But it’s what we choose to do in spite of our fear that defines us, don’t you think? Looking back, I can see that the internal narrative I spent years subscribing to – the one telling me I wasn’t a ‘people person’, that I didn’t make a good first impression, that I didn’t have anything to say, that I was shy (yes, really) – was simply a way of protecting me from that judgement. There is safety in corners. But up on stage, who knows what hurt could be hurled my way. Yet I’ve spent days now drinking in heartfelt thanks and praise for my TEDx talk. People have told me how it was just what they needed to hear that day. How it needed to be said. They’ve called me courageous, graceful, ‘a natural’, and I have blushed and glowed and given gratitude and opened my mind to a sliver of possibility that they could be right. LIZZY, we are PROUD of you here at SPEAKER Express! You can watch Lizzy’s TEDx on SELFISH WINS here. If you want to get on a TEDx stage, start here! OR book one of our trainings to work on your content & structure.